My new book, Empower: What Happens When Students Own Their Learning is now available on Amazon. This has been a journey to create a book that is really different, and a risk to put it out to all of you. I’m not going to lie…I’m going to be so interested to hear what you think of the message, the visuals, the layout, and the idea that our students can own their learning! You can get your copy by clicking here to purchase on Amazon. *Note: Sometimes Amazon will say it is “out of stock” but that does not mean you can’t purchase. You can still purchase and be the next to receive a copy! With Launch and previous books, I’ve always sent out review copies to folks to get endorsements. This time we want you to have first dibs at reading the book, and instead of endorsements, we want feedback from real teachers, real school leaders, and educators doing the work! In Empower, we provide teachers, coaches, and administrators with a roadmap that will inspire innovation, authentic learning experiences, and practical ways to empower students to pursue their passions while in school. Compliance is expecting students to pay attention. Engagement is getting students excited about our topics, interests, and curriculum. But, when we Empower students they crave learning that is both meaningful and relevant to their life now and in the future. Empower is focused on what happens when students own their learning, but also on how to get to a place where that is possible in the midst of standards, set curriculum paths, and realities of school that we all have to deal with. Written by real educators who are still working in schools and with teachers, Empower will provide ways to overcome these challenges and turn them into opportunities for our learners to be unabashedly different and remarkable. Interested in buying more than one copy? 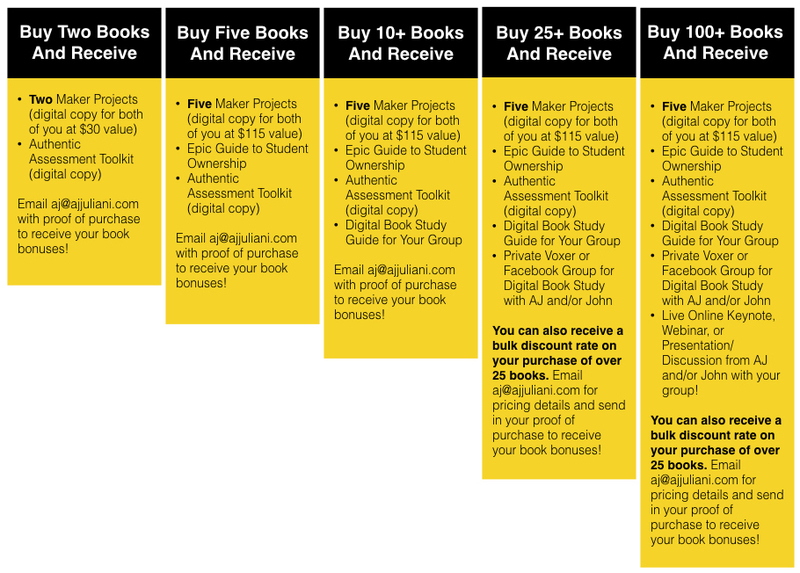 Email aj@ajjuliani.com with proof of purchase to receive your book bonuses! Receive discounted rates on purchases of 25+ books. Please email aj@ajjuliani.com with interest and upon proof of purchase, we will send over your book bonuses! I wrote a grant and just purchased 20 books via Amazon to do PD with my leadership team (consist of teachers that are department chairs and grade level leaders, school principal, school administration, librarian, and testing coordinator ) to build dialogue about leadership skills and how to enact positive instructional change for our students. I know your book will be a positive force but I am trying to find any great guided questions or best format to break down the book over a course of 4 months (Flexible). Any recommendations?? Thank you for your time and writing this great book. I am hoping to really use this to shake things up and build some strong leaders (administration and teachers) here at my middle school. I was wondering if you would be able to share how you used the book with your staff. We are interested in creating a book study and wonder if you have anything that you did that was successful or helpful you could share.